Summer in Armenia always means apricots. 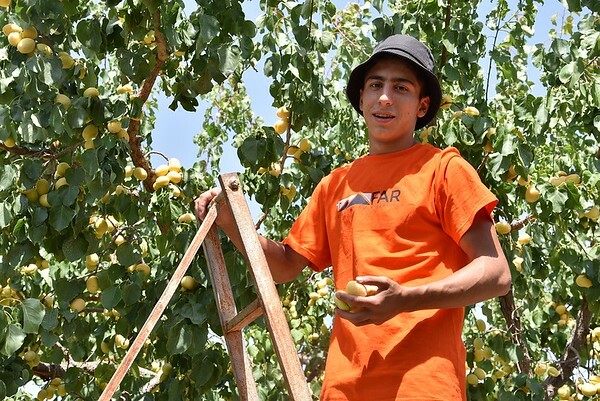 And apricot season means it’s time for FAR’s scholarship students to help out with the harvest in Yervandashat, one of the Armarvir Province’s most scenic villages. Every year, about two dozen recipients of FAR’s scholarships, including the Mathevosian, Nishanian, Gulamerian, Armine and Garabed Zambak, Mardigian and Berberian programs, volunteer to help out with the harvest. While they’re encouraged to do so, it is not mandatory. Not only is it their way of giving back to FAR, it’s also a wonderful demonstration of the lesson of the importance of service that the scholarship programs seek to instill. This year, 21 students braved the extreme heat to pick apricots, a portion of which will go to Vanadzor Old Age Home, FAR’s five soup kitchens, and the FAR Children’s Center. Students spent a week at the orchards which are owned by five different farmers, all of whom are members of the Yervandashat Agricultural Association Consumers Cooperative. They worked in shifts to pick and sort the fruit. Arkady Khachikyan, the co-op’s president, put them up at his home along the Araks River. FAR helped each of these farmers to develop their businesses, and in return the farmers have agreed to donate a portion of dried fruit to FAR’s beneficiaries each year. Sales of dried fruit are also a great source of income for them. “This is good work that is important and useful in all respects. Now, 1,000 of our program beneficiaries will be able to enjoy dried apricots during the coming winter,” said Eduard Karapetyan, FAR’s Education and Science Programs Manager. Three different groups of students each spent a week working in the orchards; all managed to stay enthusiastic as they learned more about teamwork and persistence. “These events will stay in their memories for a lifetime, I think. This is much more for them than just apricot picking,” said FAR’s Executive Director Garnik Nanagoulian.